Our HONEY & CINNAMON buttonettes are a fusion of Nectar & Spice - deliciously sweet, honey infused, creamy milk chocolate buttons sit along side subtly spiced, mellow dark chocolate buttons. Mini chocolate buttons of made with our luxury house blend of chocolate, these Buttonettes are a grown-up little treat when you just need a little nibble. 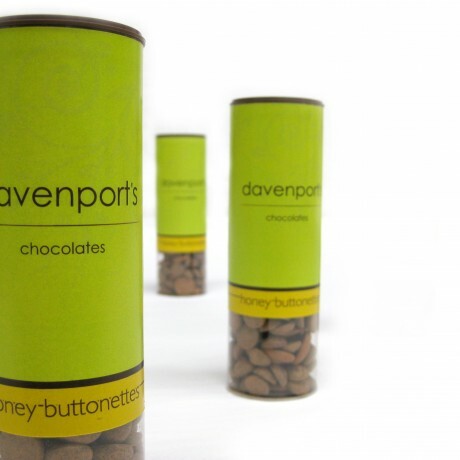 The childhood classic chocolate button re-invented for adults, these tubes of buttonettes are the perfect size to fit in your bag, the top drawer of your desk or anywhere close to hand! SERVING SUGGESTIONS: Simply serve on an elegant plate as a accompaniment to after dinner coffees. Stir a few into a hot chocolate for a sophisticated chocolate infusion. Add a twist to muffins or chocolate chip cookies. Keep them handy, and nibble as required for a quick chocolate 'hit'!. Here at Davenport’s Chocolates we love making chocolates. It is our passion. It is our life. Creating chocolates that put a smile on your face, and make an involuntary ‘Mmmmm’noise is our mission. All our ingredients are sourced as ethically as possible, as well as tasting amazing. Our cocoa beans are bought from co-operative farms which give back to the local community. Please note that we list this as a wheat, nut and egg free chocolate. However, this is still made in our small boutique factory, where other allergen ingredients are used, so please do not order this product if you have wheat/nut or egg related allergies. Thank you. Dark Couverture Chocolate (Cocoa Mass, Sugar, Cocoa Butter, Emulsifier: Soya Lecithin, Natural Vanilla Flavouring), Milk Chocolate With Honey (Sugar, Cocoa Butter, Whole Milk Powder, Cocoa Mass, Honey Powder, Emulsifier: Soya Lecithin, Flavouring, Natural Vanilla Flavouring), Cinnamon, Colour Powder With Mica, Titanium Dioxide And Iron Oxides (E555, E172, E171). Per 100g: Energy 2305.7kJ/ 550.8kcal, Fat 36.4g (of which saturates 21.8g), Carbohydrate 46.8g (of which sugars 44.3g), Fibre 6.4g, Protein 5.2g, Salt 0.06g.